December | 2014 | Goin' Mobile - Adventures of a Travelin' Music Junkie! At 6:00pm, as the sun was moving further away from the sky over Bottle Rock, as the heat of the day faded, and the weather changed to perfect, a favorite local San Francisco band took the main stage. Train, (http://savemesanfrancisco.com) with it’s charismatic lead singer, Pat Monahan, commanded the audience with a confident presence. They love what they do, and it shows! I first saw Train at South By Southwest in Austin, Texas in 2012 (http://sxsw.com,) where they did a phenomenal job performing at the Central Presbyterian Church. Tonight’s show was very different, on an outdoor stage in Napa, California’s wine country, as the sun was going down, and a crowd that was ten times larger. Any way you see them, though, they put on a good show. Singing many of their most recognizable hits – Soul Sister, Calling All Angels, Save Me, San Francisco, Meet Virginia, Drops of Jupiter – they easily got the crowd singing and swooning right along, right away. Monahan was all over the stage – and it was a big one – getting up-close and as personal as a singer can in a venue so huge. At one point, he pulled out his cell phone and took pictures of the crowd from the stage, and later in the show, he jumped into the audience and took selfies with people and their phones. 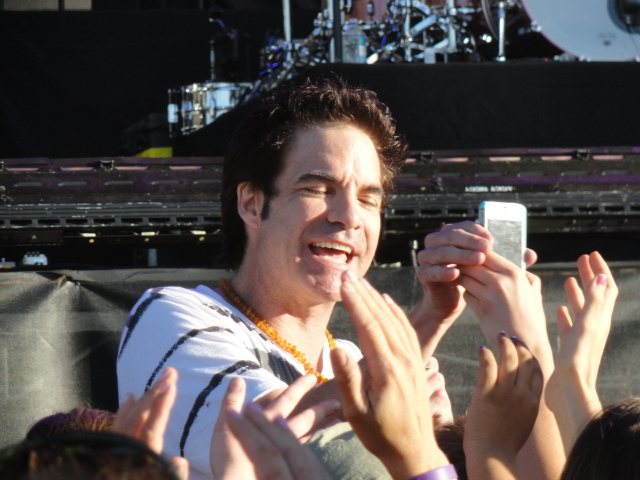 Pat Monahan is a crowd friendly performer, no doubt, and it was so very apparent just how much fun he was having. 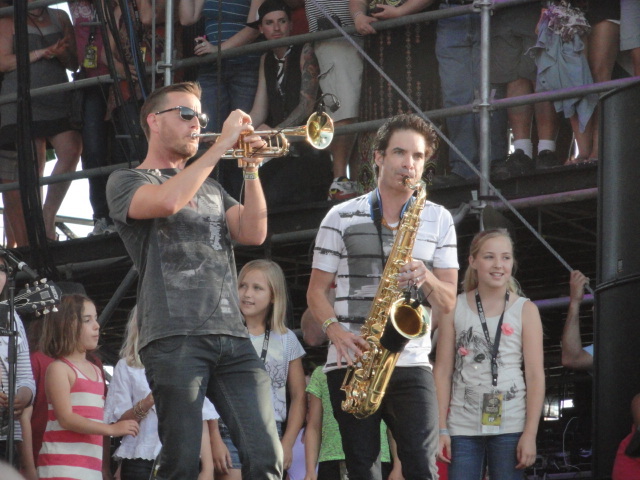 And, not only is he a singer, he is a musician, which he proved when he picked up the saxophone and played along with his band. Whatever your opinion is of the band Train, they have cut out a name for themselves in the music industry. Their songs are catchy, a bit poppy, with sometimes rather odd lyrics (“my heart is bound to beat, right out my untrimmed chest” or “just a shy guy looking for a two-ply Hefty bag to hold love.”) Where they come up with such odd, kind of nerdy, lyrics is beyond me, but it’s not my place to judge. They are good; they are successful; they have made a name for themselves in the world of music, and that’s admirable and honorable. As the evening settled in, and the sun began to fade, Train’s show came to an end. The emotion exuding from the band was felt by, no doubt, everyone in the audience. Monahan’s appreciation to the crowd for their warm response, and the fact that he was overcome with gratitude that practically brought him to tears, was wonderful sight. Sometimes it seems to me like celebrities are untouchables, or on a higher plane that the rest of us mortals (or think they are!) So, to see them in such an obvious state of appreciation and indebtedness, is heartwarming. It shows that they are human, after all. 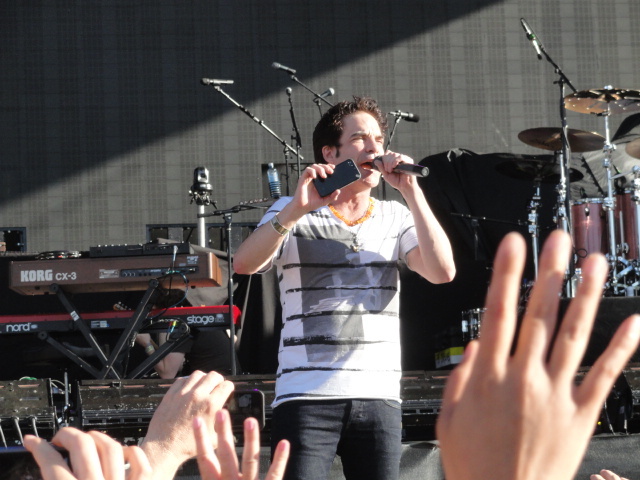 These guys might not be the Rolling Stones, but they are Train, and train rocked Bottle Rock 2013! Up-close and personal with the fans.